The photodetectors in Alan Migdall’s lab often see no light at all, and that’s a good thing since he and his JQI colleagues perform physics experiments that require very little light, the better to study subtle quantum effects. The bursts of light they observe typically consist of only one or two photons or even less than one photon. Their latest achievement is to develop a new way of counting photons to understand the sources and modes of light in modern physics experiments. By recording the number of photons in each pulse of light over a long time, and preparing sets of probabilities for the number of photons in pulses, the existence of various light modes present in the weak light field can be determined. This method is very useful because most light detectors that can see light at the level of a single photon cannot otherwise tell the exact frequency or position of the light, which makes determining the number of modes difficult for such fields. The JQI work, done in collaboration with the INRIM lab in Italy, uses a detector “tree” that counts photon number. It does this by taking the incoming light pulse, using mirrors to divide the pulse into four, and then allowing these to enter four detectors set up to record individual photons. If the original pulse contained zero photons then none of the detectors will fire. If the pulse contained one photon, then one of the detectors will fire, and so on. 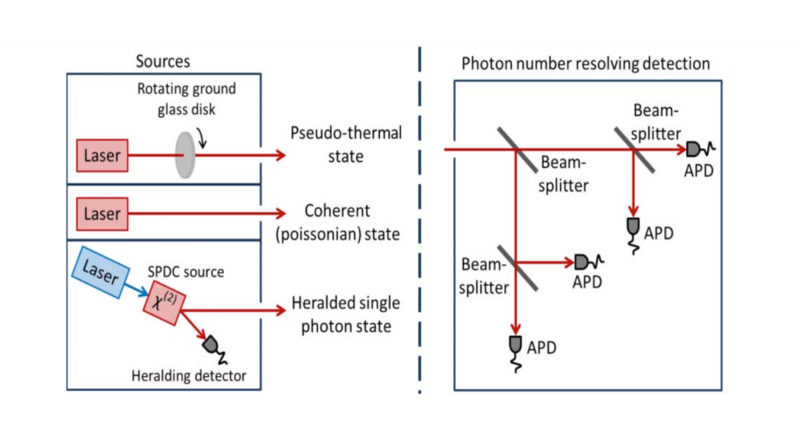 This novel use of higher order photon number statistics as a way of understanding the modes present in light pulses will help in keeping tight control over light sources that emit single photons and those that emit pairs of entangled photons.